Jennifer Cluff: how to speed up the piece "Arrival of the Queen of Sheba"
how to speed up the piece "Arrival of the Queen of Sheba"
Hi. This is my first posting. Anyway, I have recently purchased the Book The Magic Flute of James Galway, and it has a ton of awsome music in it. I am working on the Arrival of the Queen of Sheba. I can play it at quarter note = 95 and it is suposed to be played at qurter note=138. yould you please give me some advice on how to speed this up. The Queen of Sheba is very very very difficult at high speeds, such as the speed at which James Galway plays it. Don't be discouraged if you can't play it at mm=138 for several years. Playing it slower is fine too. - lots of time spent discovering how to balance the flute between the two hands. 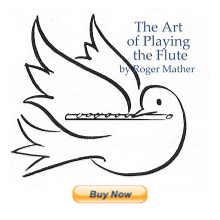 Your private flute teacher will be of more help than written replies, as they will know what you should work on first.